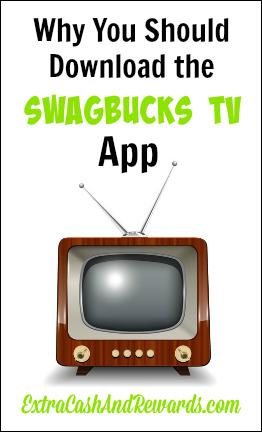 In case you weren't aware, Swagbucks has a terrific little TV app you can download in addition to using Swagbucks on the web. This app is available for iPhone, iPod Touch, and iPad Apple devices as well as Android devices like Kindle, Nexus, Samsung Galaxy, and more. You may already know that you can earn up to 150 Swagbucks per day just for watching videos on Swagbucks TV on your computer. Every single day! And if you have the app installed, you can earn up to 50 more Swagbucks per day for watching Swagbucks TV on your device. So that is a total of 200 Swagbucks every single day you can potentially earn for watching videos. These videos consist of movie and TV trailers, comedy clips, recipes, and all kinds of other things, so they're not always dull to sit through. It only takes 450 Swagbucks to cash out and get a $5 Amazon gift code. If you can earn up to 200 Swagbucks per day just for watching videos using both your computer and your mobile device, you should be able to cash out pretty regularly! I have been a member at Swagbucks for years now and I've redeemed multiple times, so I can confirm they are the real deal if you're skeptical. I have seen a few mentions online about the app freezing up and crashing on occasion. Go here to learn more about Swagbucks and sign up. If you're already a member and just want to get the apps installed, you can do a search for SBTV to find the apps in your app stores. Good luck!